Not a planned shot. My neighbor bought me a coffee from Starbucks and dropped it off for me – thank you. I took of the lid to add my milk and there were the bubbles. My camera was right there, so I placed it next to the kitchen window. Done. Me like! Now that’s taking advantage of all that coffee had to offer. That’s as close to putting the taste into a photo as I’ve ever seen 🙂 Great shot! very interesting! Love the reflections. 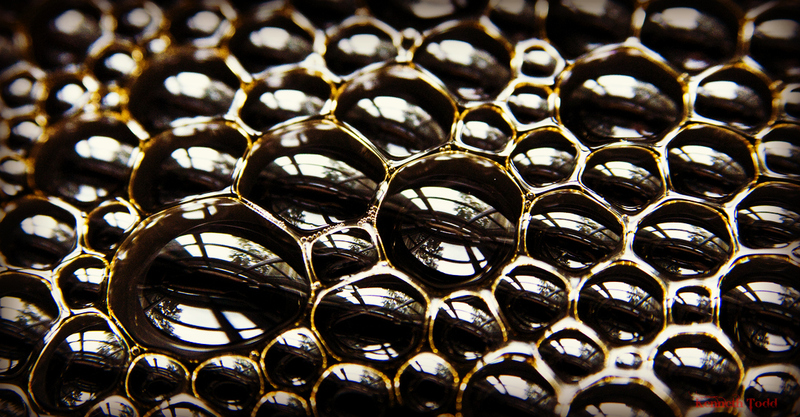 Have to be honest, when I first looked at this shot, I thought it was a close up of a honey comb! Cool shot! I thought the same when opening it. thanks for comments. Wow – awesome! I don’t usually think of coffee having bubbles, so this is a great observation. Another great shot, of one of my favourite things. Your photos are always stunning. Thank you Jennifer, appreciate it.